Hot summer days mean packing up and escaping to the beach for some instant relief and relaxation. After setting up your chairs and blankets, you anchor the umbrella into the sand for some shade, with hopes that the sea breeze doesn’t blow it away. The Noblo Umbrella Buddy is the perfect solution to ensuring your umbrella stays secure. 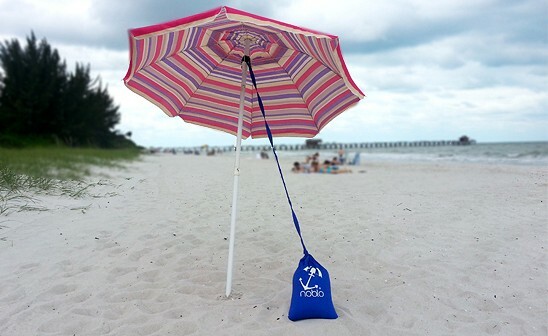 Developed by two mothers, Bess Abraham and Kathleen Pisano, the Noblo allows you to be worry-free and safe while enjoying a day at the beach. It comes in a variety of fun colors. Fill the Noblo with sand and attach it to your umbrella's base. Make more time for swimming, surfing, and sand castles this summer and don’t forget to pack the Noblo when you hit the beach! Hot summer days mean packing up and escaping to the beach for some instant relief and relaxation. After setting up your chairs and blankets, you anchor the umbrella into the sand for some shade, with hopes that the sea breeze doesn’t blow it away. The Noblo Umbrella Buddy is the perfect solution to ensuring your umbrella stays secure. Developed by two mothers, Bess Abraham and Kathleen Pisano, the Noblo allows you to be worry-free and safe while enjoying a day at the beach. It comes in a variety of fun colors. Fill the Noblo with sand and attach it to your umbrella's base.